This quaker deck drain system is made with a heavy wall that is bondable. 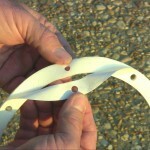 All of the components are made from rigid PVC. The durability is proven in years of outdoor applications with lasting beauty. The 2″ deck drain away system adapts to all of the standard 1 1/2″ plastic fittings. 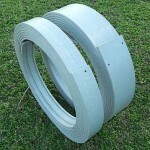 The joints bond together like PVC pipe and we also supply the PVC connectors. Cleanouts will adapt to the 1 1/2″ threaded(purchased locally) or the connector that is supplied. If you would like a surface cleanout hole you can simply drill a 1″ hole and snap in our cleanout fitting. To clean, remove the plug and flush it with the hose. There are two of these supplied in every carton. Due to the shipping variables, for a case of the drain or to order individual pieces call 800-488-9146 or email us at orders@frankwall.com for a freight quote.